Visual Composer is a fantastic plugin that adds a drag & drop page builder to your WordPress theme. You can create unique page easily & fast with a lot of page elements. Make sure you have install and activate Visual Composer plugin to take advantage of all it’s wonderful features. Once activated, Visual Composer gives you control over the layout of your pages. 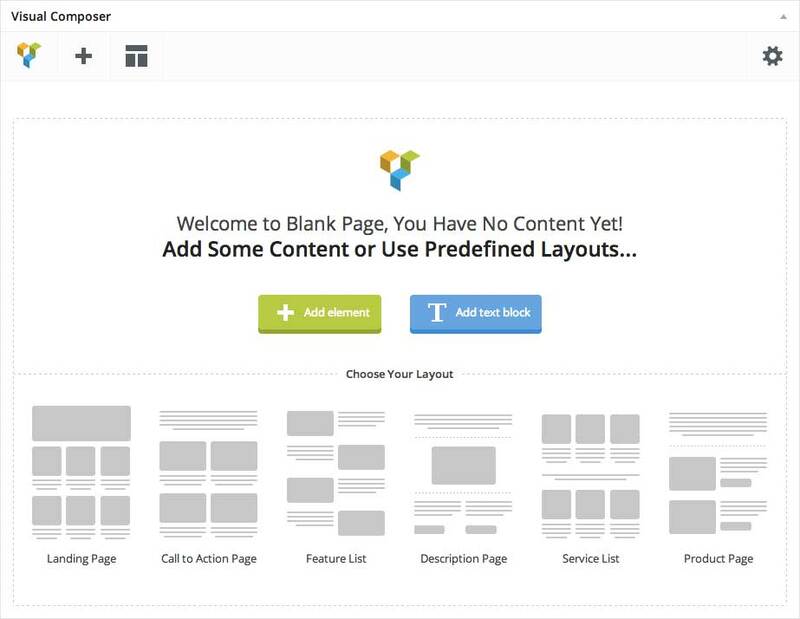 Just add a new page, and select template Landing Page Builder – Visual Composer then click Publis button and after that on the blue Backend Editor button to access the builder. Row of root element is like Section on section builder. 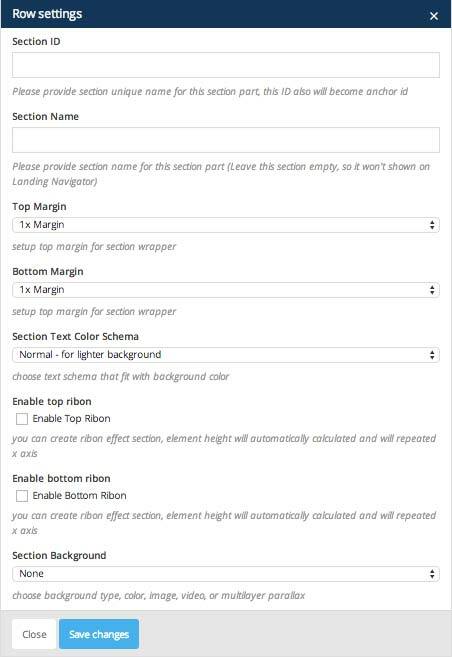 It’s wrap elements in a section that has options to set Background type, Margin, Text Color Schema, Ribbon and Section Name just like section in section builder. 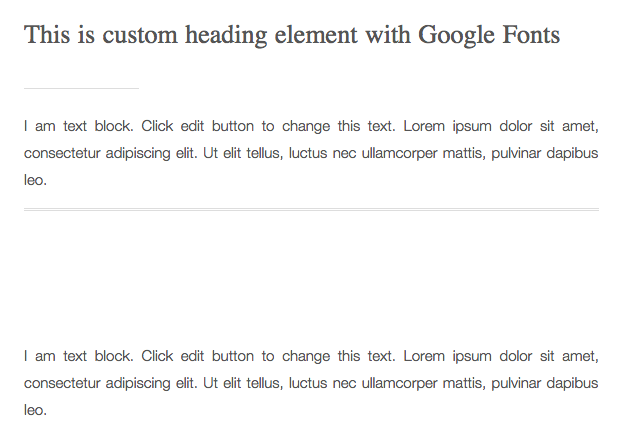 To start building page, you need to add row as wrapper of page elements. If you are using light background, you will need to use normal text schema. It’s fit for light background or if you are using dark background, you can choose to use light text color. It will fix for darker background color. 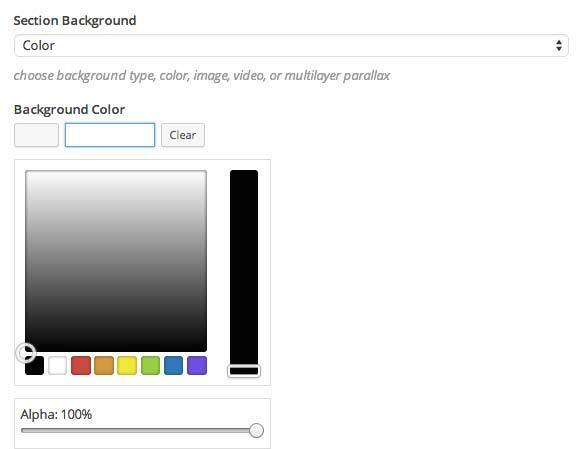 Choose this option if you want to use color for your section background. 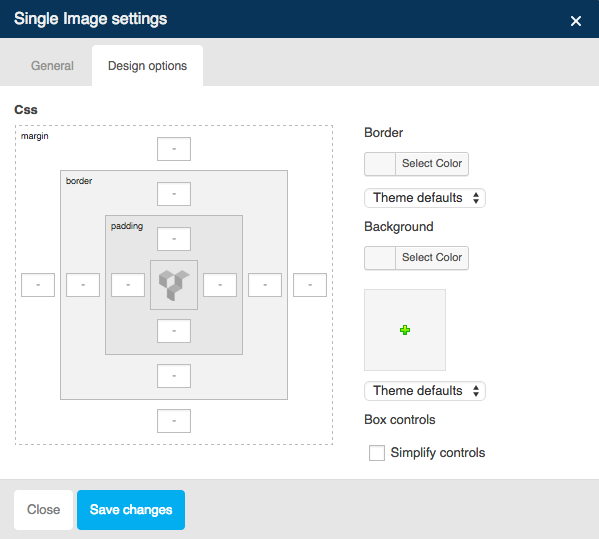 With this option you can put different image, or pattern as your section background. Image Background : Select or upload your image for section background. Background Overlay : Set color for overlay background. 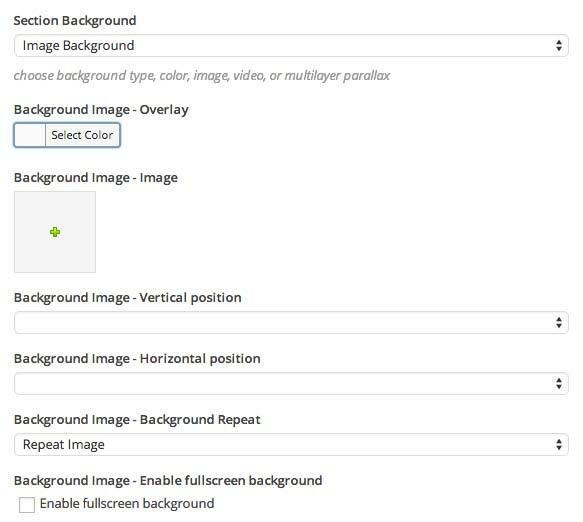 Enable fullscreen background : Enable this option to make background fit into section container size. 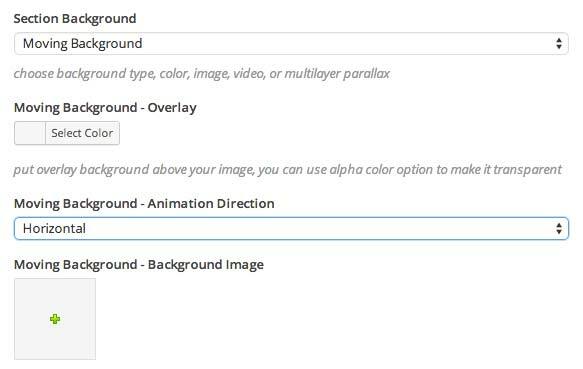 This option will move your image background from left to right. You can put icon or something like that to make your section look more alive. This element will move overtime. 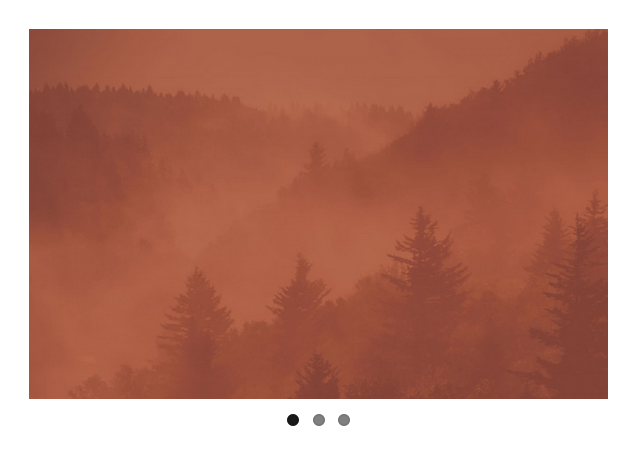 Create background with very Smooth Parallax effect and with Unlimited layers. 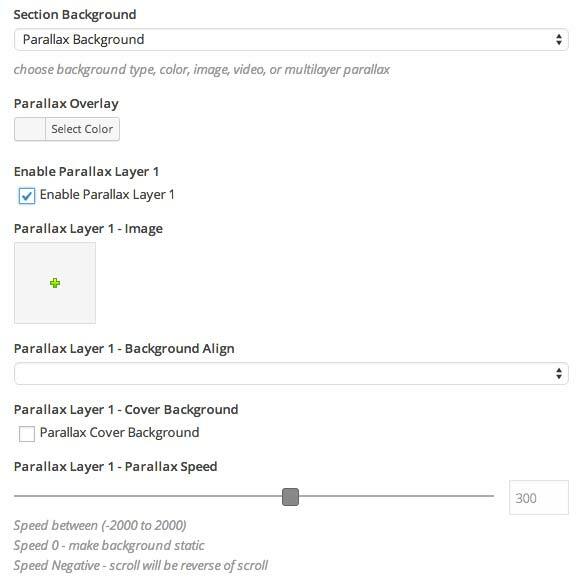 You can enable the Parallax Layer 1 until 10 as you need. 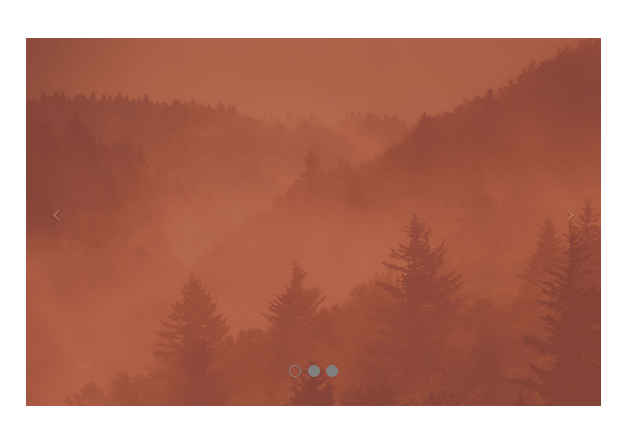 Parallax Image : Select or upload your image for section background. Enable cover background : Enable this option to make background fit into section container size. You can also have option to use video background for your section element. Background Fallback Image : Select or upload image to display if video doesn’t load properly. MP4 format Video : select or upload MP4 video format. WEBM format Video : Select or upload WEBM video format. Background Overlay : Ser color for overlay background. 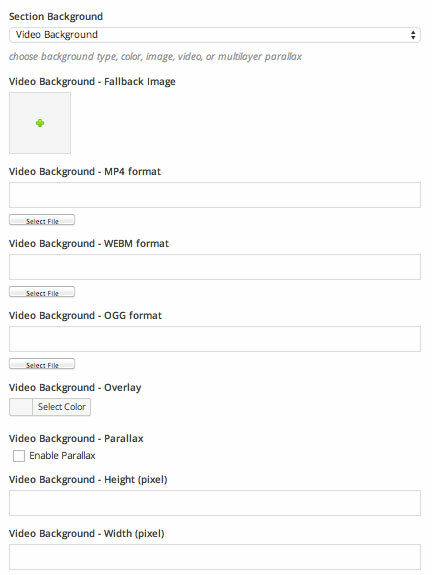 Enable Video Parallax : Enable this option if you want to add parallax effect. 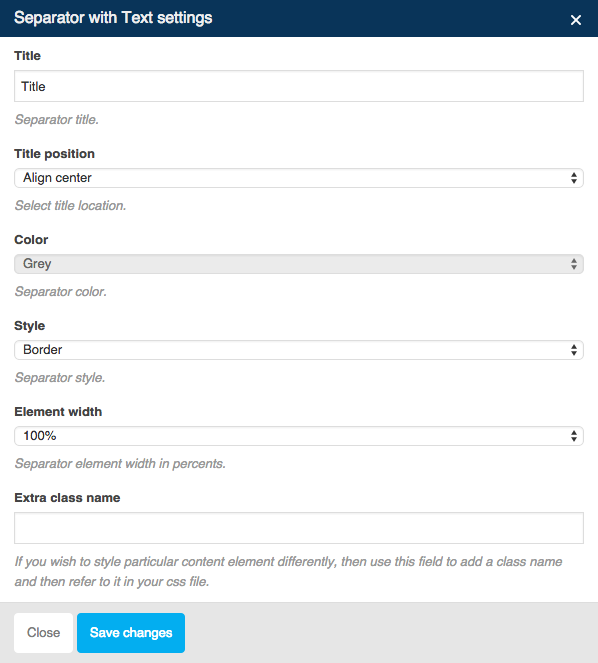 We are using quite different method to add column on Visual Composer. We are disabling top column spliting but only enable inner row & column spliting. To create Column, first you need to Add Row (this row will be a section). Then you will need to Add Row once again by select Add Element Button Inside Row after that select Row element and this row will be a column on these row that you’ve created previously. 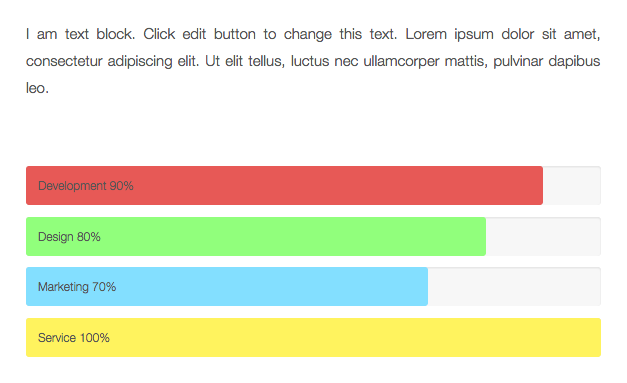 Font Color : Set your font color for this row. Extra Class Name (Optional) : Add aditional class in case you need to add custom styling for this element. 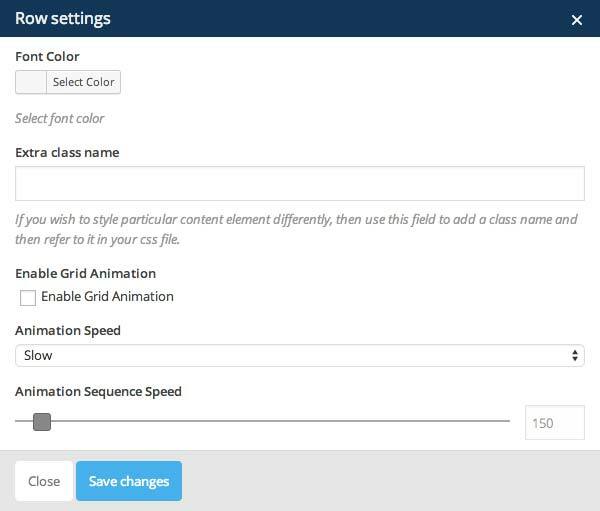 Enable Grid Animation : Check this to enable show animation for row. Sequence Speed : Set numer of sequence speed of animation. Font Color : Set your font color for this column. 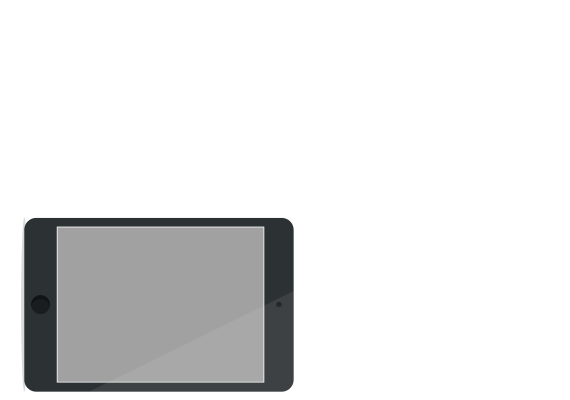 Hide on iPad : Check this to hide this column and entire content on iPad device. Hide on iPad : Check this to hide this column and entire content on device with resolution 1024px width and lower, such as iPad. 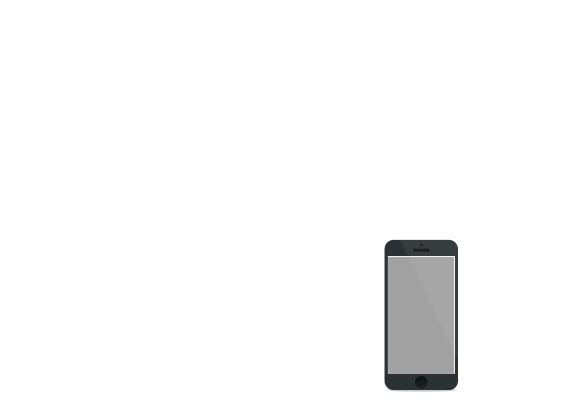 Hide on iPhone : Check this to hide this column and entire content on device with resolution 480px width and lower, such as iPhone. 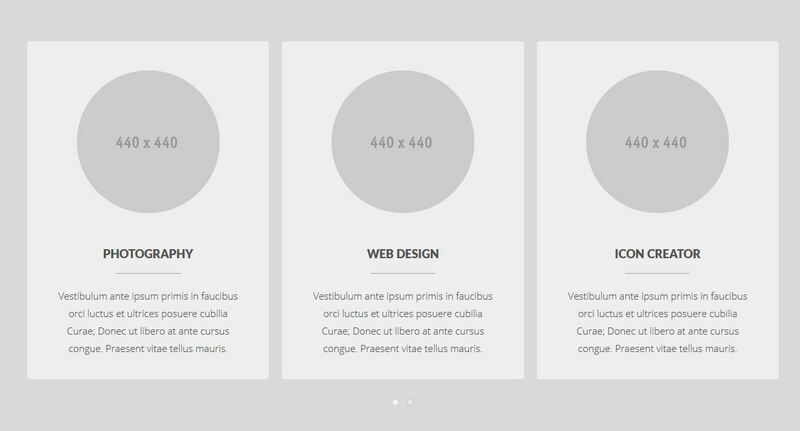 You can use this element if you want to add some of content or description into your landing page. On this element you also have JKreativ General Shortcode options. 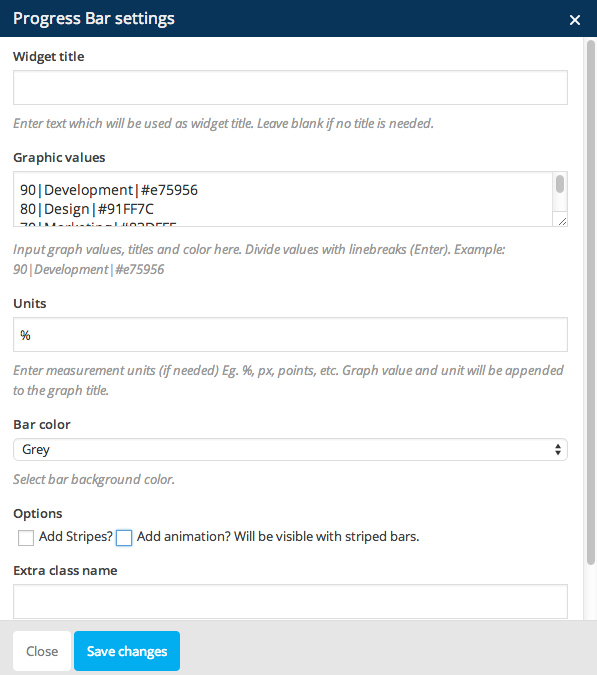 General shortcode will appear on most text area element on admin panel. For more detail information you can take a look right here JKreativ General Shortcode. CSS Animation : Select type of animation if you want this element to be animated when it enters into the browsers viewport. Add Separator line along the content or column width used to separate content. Color : Set separator color. 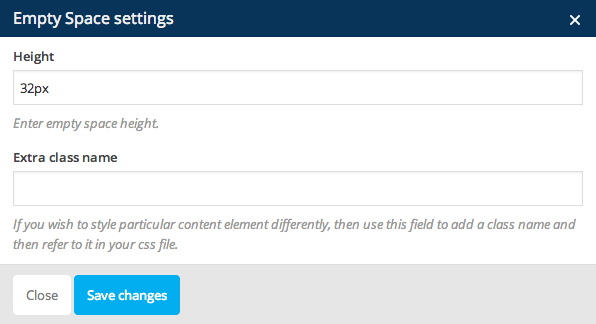 Element Width : Set separator element width in percents. 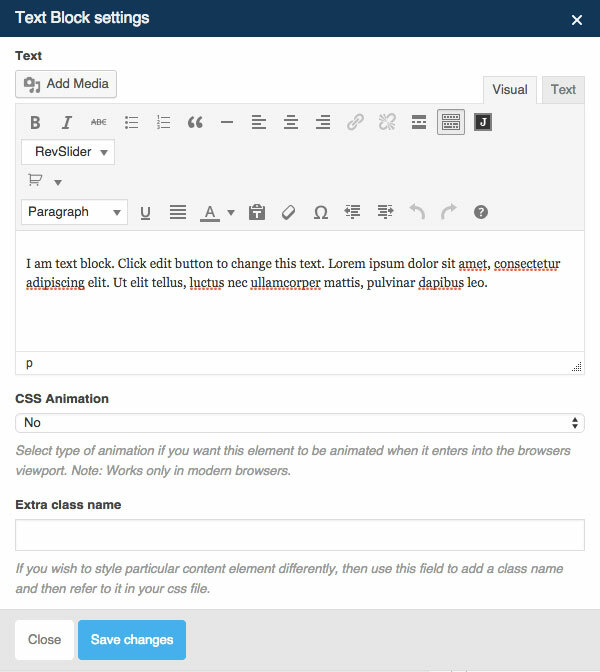 Add Separator line with Text on center are along the content or column width used to separate content. Title : Set title for the separator. Add standard alert box or message box. Message Text : Insert your message text. Expand and collapse the content inside a container with a title. Toggle Title : Set toggle block title. 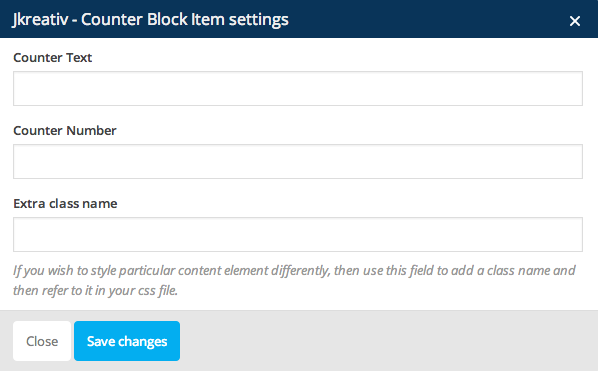 Toggle Content : Insert your toggle content. Default State : Select Open if you want this toggle to be opened by default. Add an image on your site content. 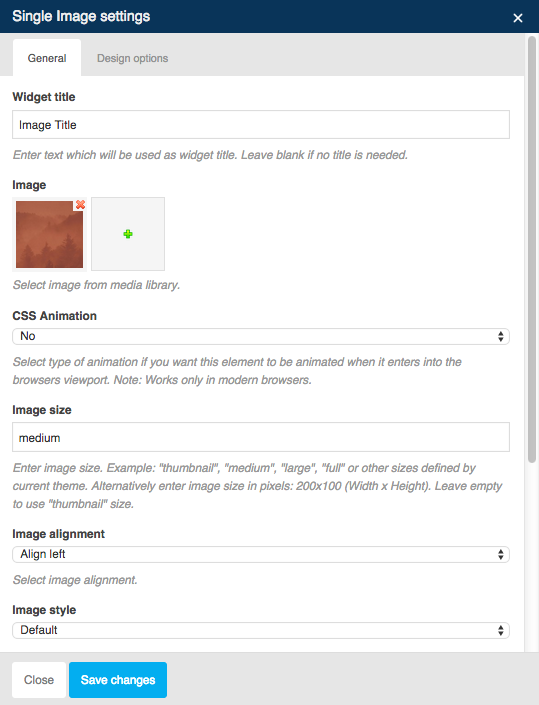 Widget Title : Set your image title. Leave blank if no title is needed. Image : Select or upload your image. Image Size : Set your image size. Image Style : Select image style that you want to use. Link to Large Image : Enable this option if you want to this image linked to the large image when clicked. Image Link : Insert URL if you want this image to have a link. Border Color : Set border color for image. Border Type : Select border type. Background Color : Set the background color for image. 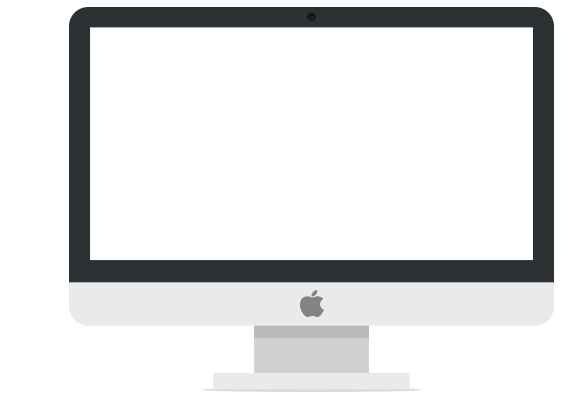 Background Image : Select of upload an image for background. Insert a series of images using from gallery. 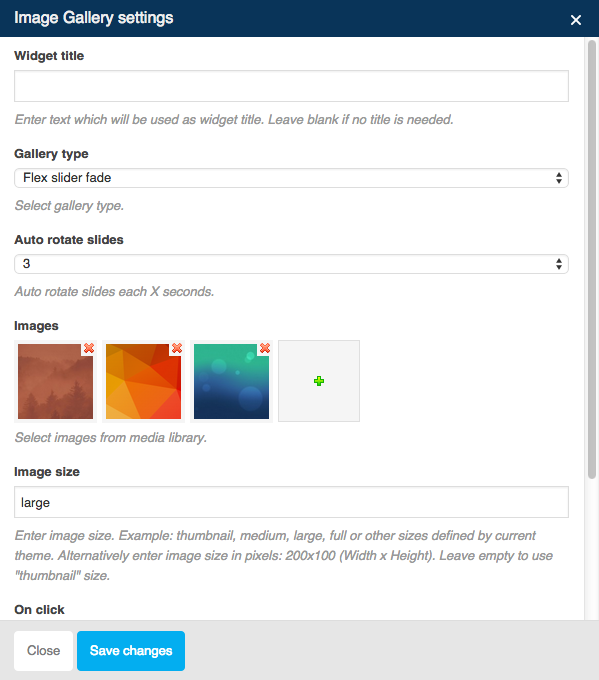 Auto Rotate Slides : Set the number of auto rotate slide your images each x seconds. Insert a series of images from gallery. 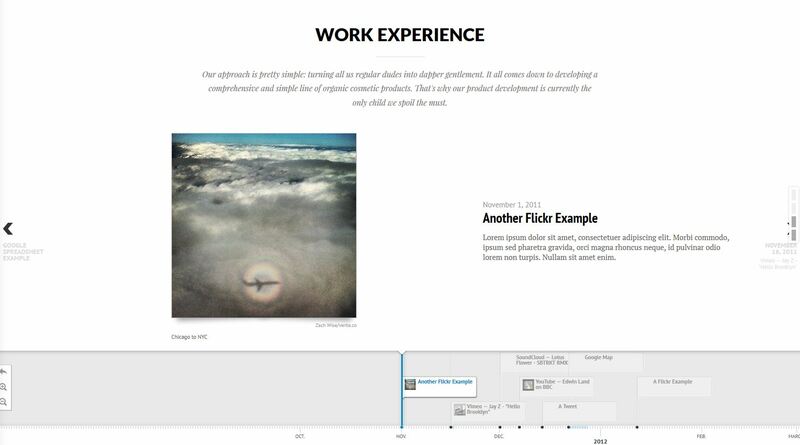 Slider Mode : Set your image slides for horizontal or vertical swipes. Slider Speed : Set your image slides speed. Slides per View : Set numbers of slides you want to display at the same time on slider’s container for carousel mode. 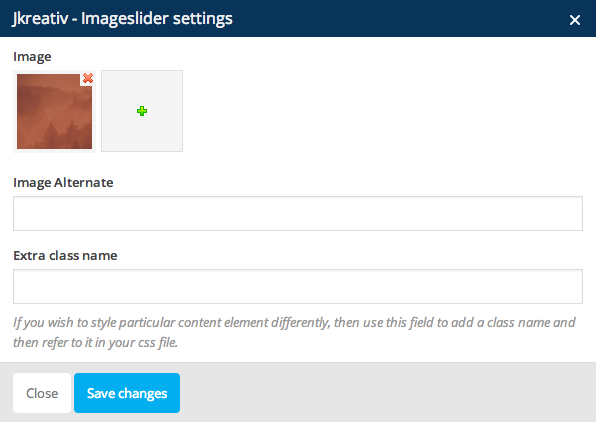 Slider Autoplay : Enable this option if you want to make your image slides automatically. Hide Pagination Control : Enable this option if want to remove pagination control. Hide Prev/Next Buttons : Enable this option if want to remove Prev/Next control. Partial View : Enable this option if you want part of the next slide will be visible on the right side. Slider Loop : Enable this option if you want to make your image slides on loop mode. Tabbing alias tabs allow you to show more content on the page using less space. Widget Title : Set your tab title. Leave blank if no title is needed. Auto Rotate Tabs : Set the number of auto rotate tabs each x seconds. Title : Set your tab title. Tour is same like tabs that allow you to show more content on the page using less space. Widget Title : Set your tour title. Leave blank if no title is needed. Auto Rotate Tabs : Set the number of auto rotate slides each x seconds. Title : Set your tour title. Widget Title : Set your accordion title. Leave blank if no title is needed. 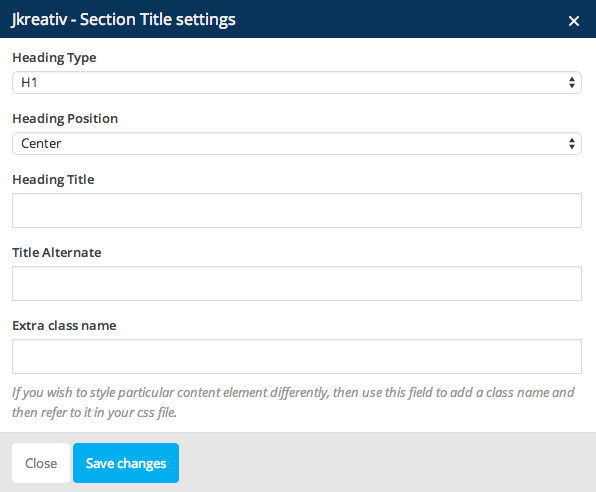 Active Section : Insert section number to be active automatically or leave blank if you want to collapse all sections. 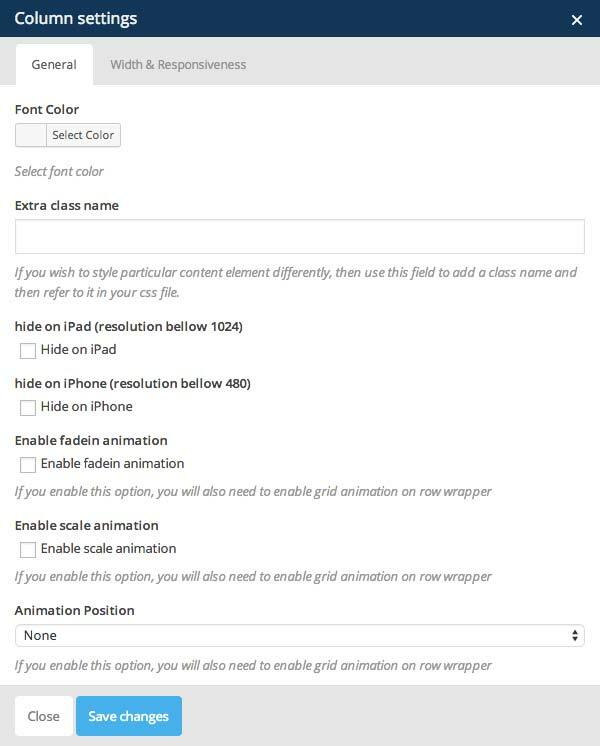 Allow Collapsible All : Enable this option if you want to allow all sections to be collapsible. Title : Set your section title. 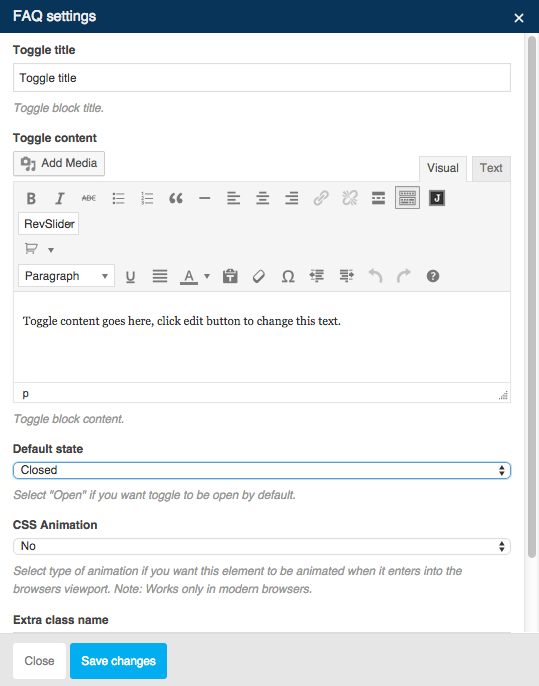 Insert button with anchor tags to direct users to other pages or sites. Text on the Button : Fill text for the button. URL (link) : Insert link into button. Color : Choose button color that you want to use. Icon : Select icon for button if you want your button have an icon. 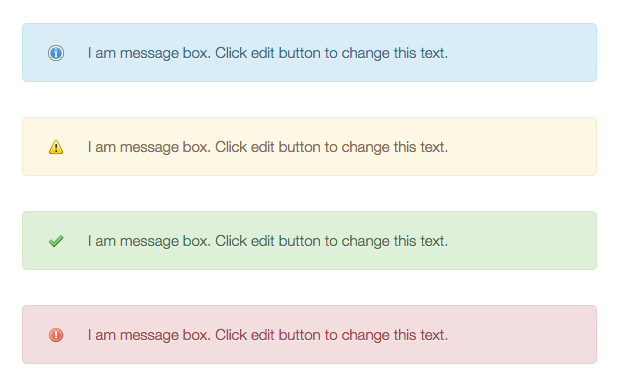 Style : Select button style that you want to use. Display skills info with nice animation progress bar. Graphic Values : Insert the graph values, titles and color. Divide each graphich item with linebreaks or just enter new line. 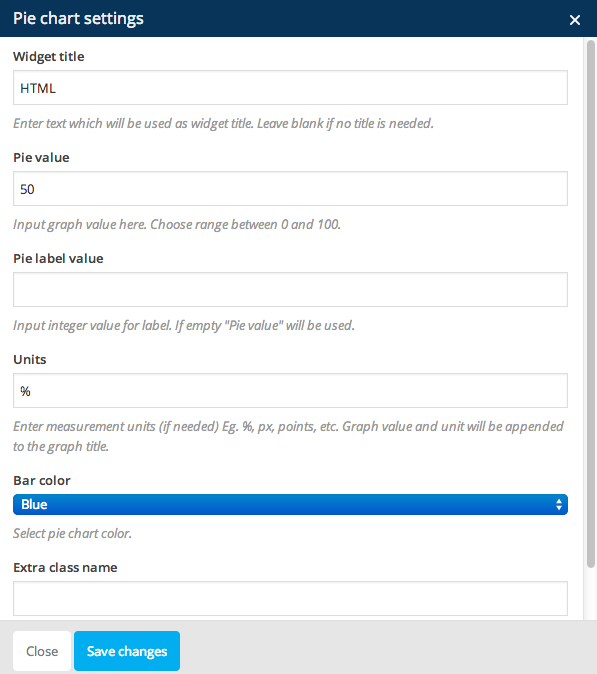 Units : Insert measurement units for the graph value. Bar Color : Select bar background color. Options : Enable the Add Stripes option if you want to make striped bar. Enable the Add Animation option if you want to make the Stripes to be animated. Display skills info with nice pie chart animation. Pie Value : Insert number of range between 0 and 100 for graph value. Pie Label Value : Insert integer value for label. 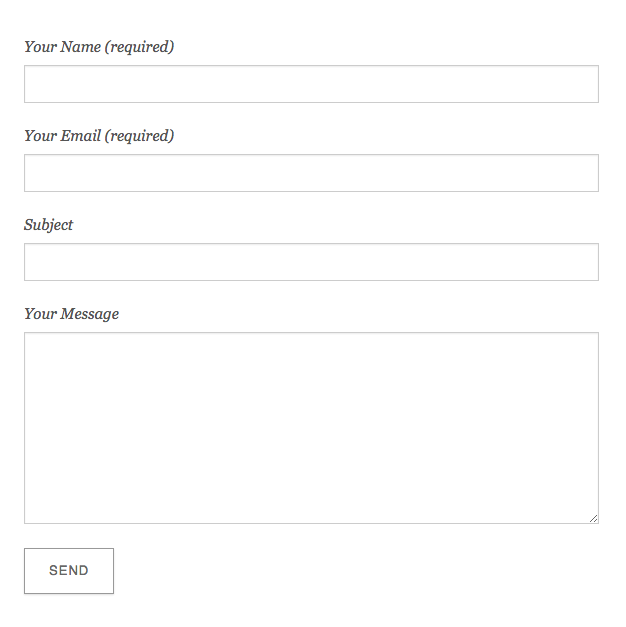 Insert form or contact form into your site content. Form Title : Set your form title. Leave blank if no title is needed. Select Contact Form : Select contact form that you’ve created. For more detail information you can take a look right here. This element is important for clearing floated element above or bellow content. Height : Set height size of empty space. Create custom title for your site content. Text : Set your heading title. 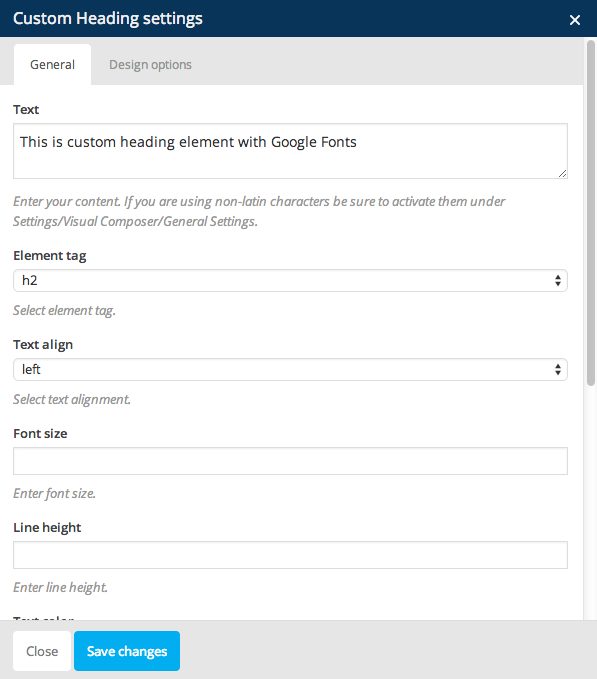 Element Tag : Choose the heading tag type. Text Align : Select the align of the title. Font Size : Set the font size for heading title. Line Height : Set the line height for heading title. 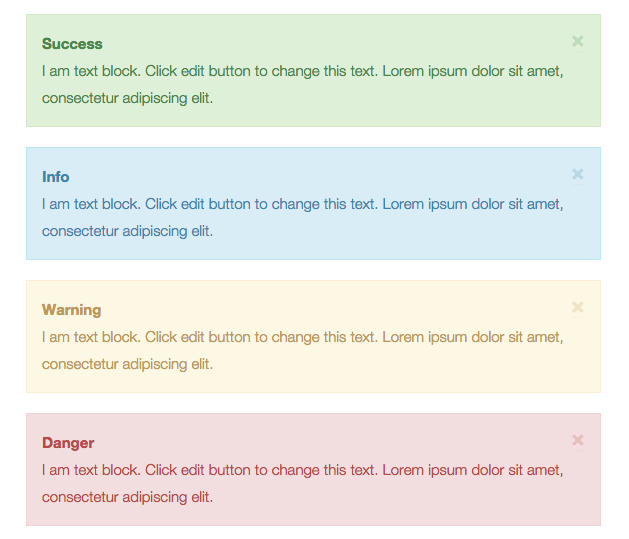 Text Color : Select color for your heading title. Font Family : Select font family for your heading title. You can insert Revolution Slider into your site content with this option. Revolution Slider : Select revolution slider that you’ve created. Add horizontal line along the content or column width used to separate content. HR Type : Select HR type that you want to use. This option is important for clearing floated element above or bellow content. Spacing Size : Set spacing size that you need. 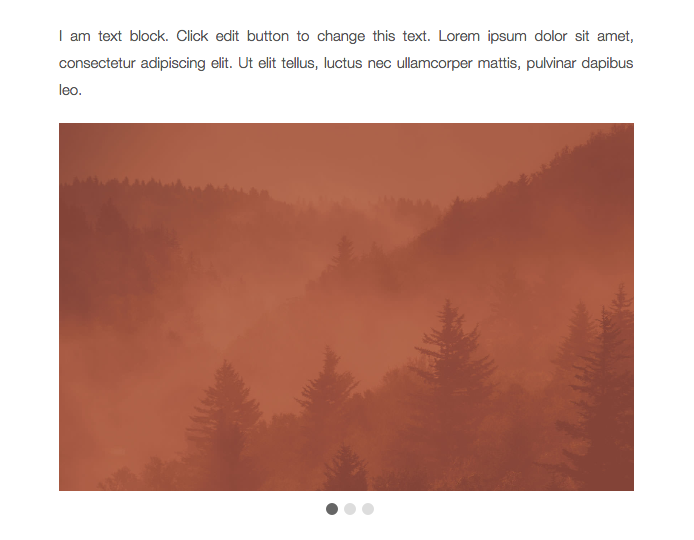 Insert an image into your site content. 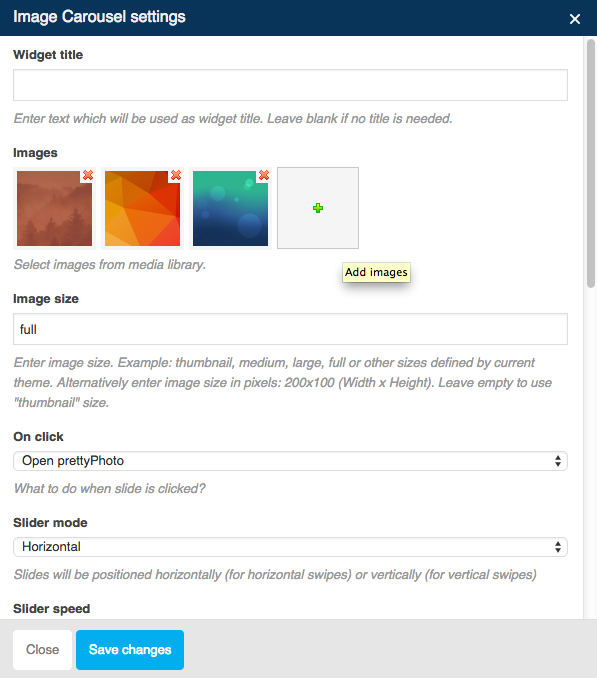 Image : Select or upload an image that you want to use. Image Title : Insert title for your image. Image Width : Set width size your image. Use Themes Zoom Script : Check this to enable image zooming into modal popup when image clicked. Insert a series of slides images. Image : Select or upload image that you want to use. Image Alternate : Set image alternate text. Create motion animation with a series of images. Animation Speed : Set animation speed your image. Animation Sequence Speed : Set the sequence speed of animation. Upload Client Image : Select of upload your image that you want to use. Enable Fadein Animation : Enable this option if you want your image have fade in animation. 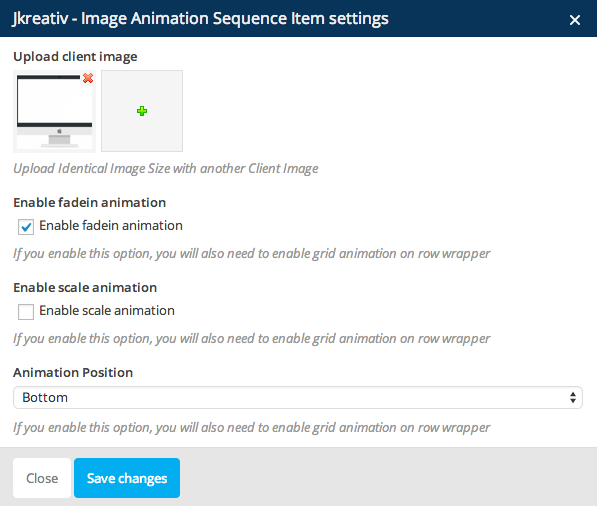 Enable Scale Animation : Enable this option if you want your image have scale effect. Animation Position : Set your image animation position. Add maps to your content with possibilities to set place/location and adding title. Map Title : Insert your map title. Latitude : Set Latitude coordinate of location or place you want to show on maps. Longitude : Set Longitude coordinate of location or place you want to show on maps. Map Zoom : Set number of zoom level. Map Ratio : Set ratio or dimension of maps size. Show Popup : Check this to show tooltip with title above map pin. 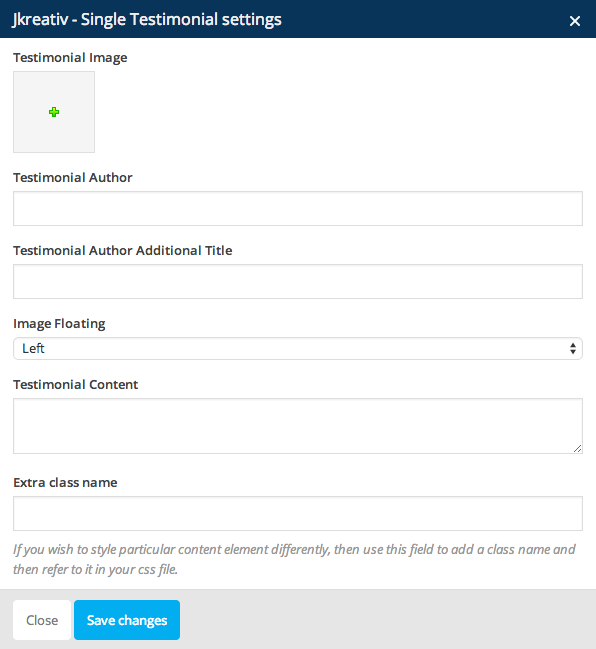 Add a single testimonial block with client picture. Testimonial Image : Upload or choose image of author. Testimonial Author : Set name of testimonial author. Testimonial Author Additional Title : Set additional text that will be added next to author name. Testimonial Content : Insert testimonial of content. Add slider of customer testimonials about your product or service. Testimonial Image : Select or upload image of testimonial author. Name : Name of testimonial author. Company Name or Position : Company name or position of testimonial author. Testimonial Content : Insert testimonial content. CSS Class (Optional) : add aditional class in case you need to add custom styling for this element. Main Text : Caption of alert box. Second Text : Main message of alert box. Show Close Button : Check this to show close button on alert box. Button Text : Button text to show what is button do or direct to. Open on new tab : If this option checked it will open target link on new browser tab. YouTube URL : Insert your youtube video url. Enable Autoplay Video : Enable this option if you want to make autoplay your video. Enable Repeating Video : Enable this option if you want to make your video repeated. 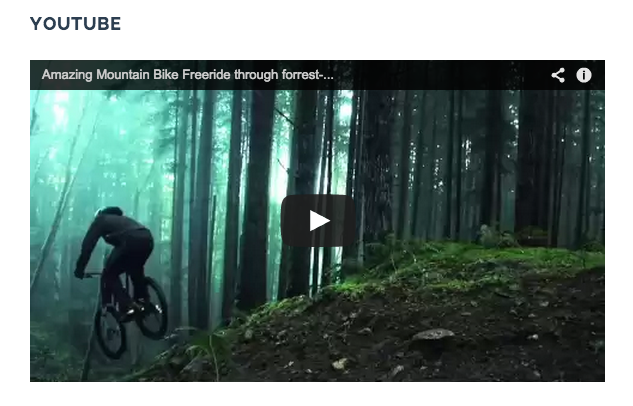 Vimeo URL : Insert your vimeo video url. 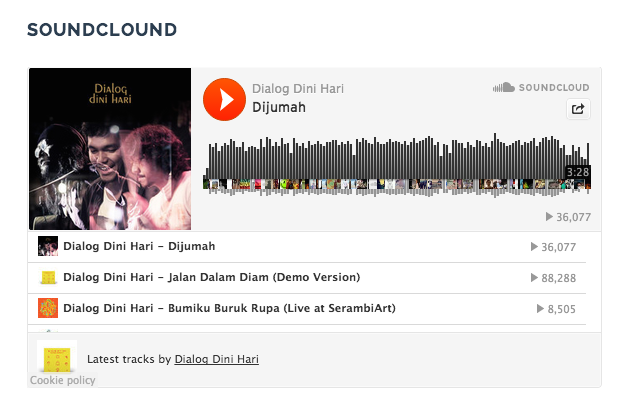 SoundCloud URL : Insert your soundcloud url. 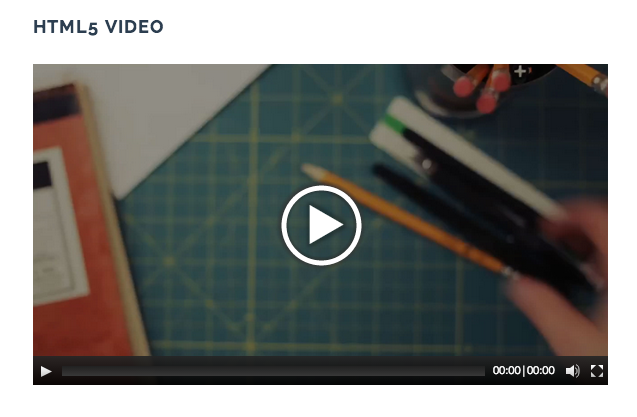 Video Cover : Insert an image as video cover. Video MP4 : Select or upload mp4 video format. Video WEBM : Select or upload webm video format. Video OOG : Select or upload oog video format. Showcasing your product in 360 degrees. Image URL Pattern : Url pattern of where 360 images placed. Number of Image : Set number of image that you provide. 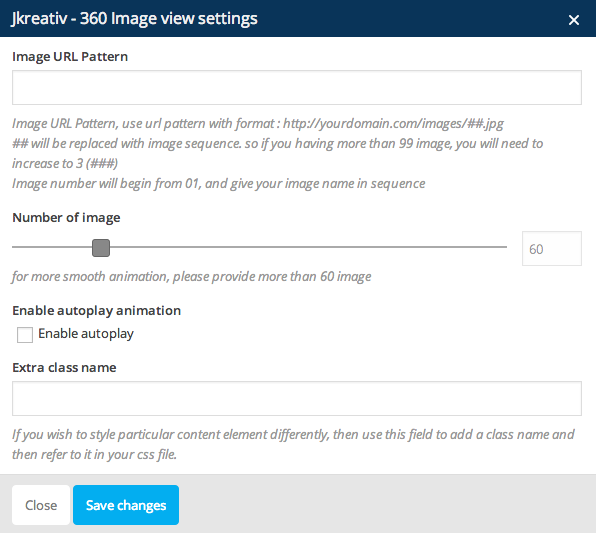 Enable Autoplay Animation : Enable this option if you want to make your image autoplay. Add all member of your team work with this option. Team Member Image : Select of upload your team image. Member Name : Insert your team member name. Description: Insert description for your team member. 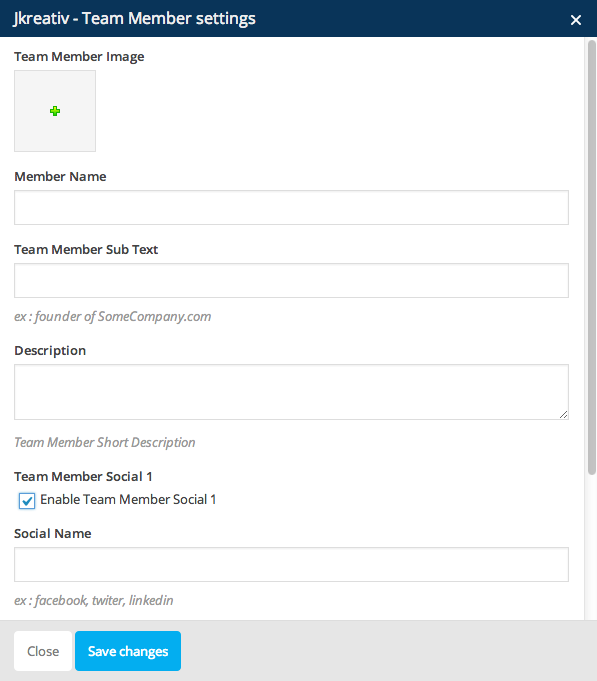 Team Member Social : Enable this option to show your team member social. Social Name : Insert your team member social name. Social Url : Insert your tema member social url. Add heading title of section. Heading Type : Select heading type for section title. Heading Position : Set your section title position. Heading Title : Insert your section title. Title Alternate : Insert alternate text for your section title. Show a pull quote within a paragraph or article of text. Quote Author : Insert name quote author. Quote Text : Insert quote text. Show promotion text with call-to-action button. Callout Text : Insert text content of callout. Callout Button Text : Insert text of callout button. Callout Button Url : Insert url link of callout button. Button Style : Choose button style that you want to use. Center Text on Callout : Enable this option if you want to make the callout text have center align. Insert or include content from external sources inside your page with HTML Iframe tag. Ifram URL : Insert your iframe url. Iframe Height : Set height size for iframe. 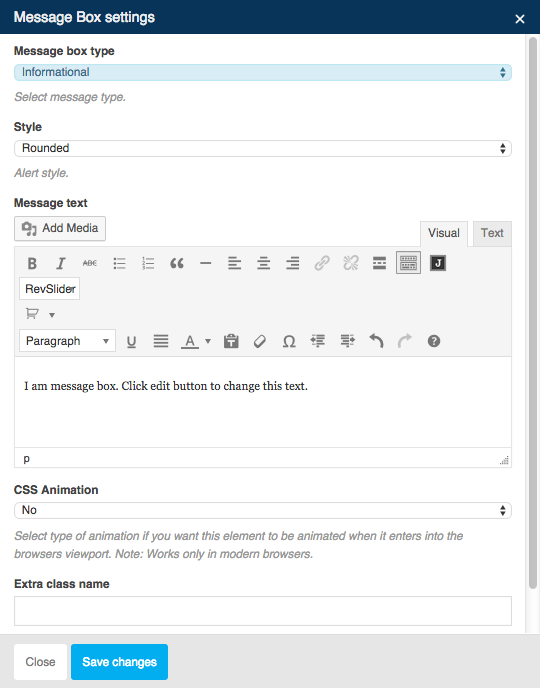 Add fullwidth maps to your content. Container Height : Set container height or dimension of maps size. 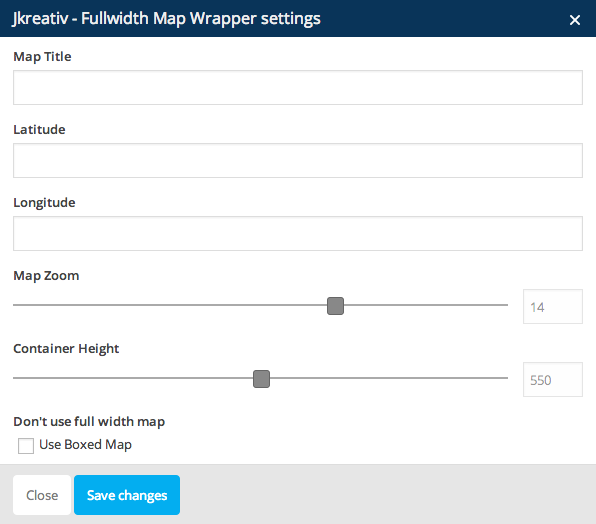 Don’t Use Fullwidth Map : Enable this option if you want to use boxed map. Text : Insert text for map detail. URL : Insert url link or leave empty if not having url. Add list slider with images, title and description. For example it used to show list of services. Service Image : Select or upload image with size 440×440 px. Service Title : Insert title of your service item. Service Description : Insert short description of your service item. Background Color : Set background color for item block. Text Color : Set text color for all text on item block. Add section list with icon, title and description. For example it used to show list of services. Service Item Width : Set width of service item. Service Icon : Select icon from list. Add section blog post list. Counter Block Number : Set number of post that you want to show. Read More Page Link : Insert your blog page list that will show up when clicked. Display counter block info with nice animation. Service Item Width : Set number of counter item. Counter Text : Insert text for counter item. Counter Number : Insert number for counter item. Skill Title : Insert title for skill bar. Skill Percentage : Set percentage of skill bar. Graph Color : Set graph color of skill bar. Insert logo list slider of clients or brands that you use. Number of Item : Set number of item. Client Name : Insert name of client or brand. 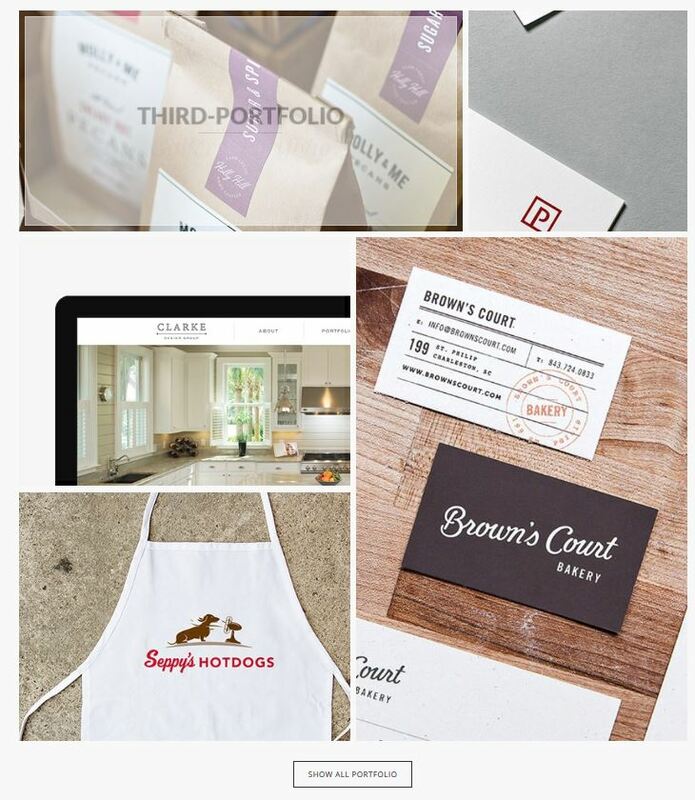 Upload Image : Select or upload logo image of client or brand. Add slides of your latest product. Product Number : Set number of product that you want to show. Column Number : Set number of column for product slider item. Product Image Dimension : Set dimention of product image. Portfolio block using masonry effect, but you will need to arrange it as you want. it having 3 option for width (1/3, 1/2, 2/3) and also 2 option for height, (1, 2 height size). Portfolio Parent : Select portfolio parent page that you want to show up. Button Portfolio Parent Link Text : Insert text of button portfolio parent. 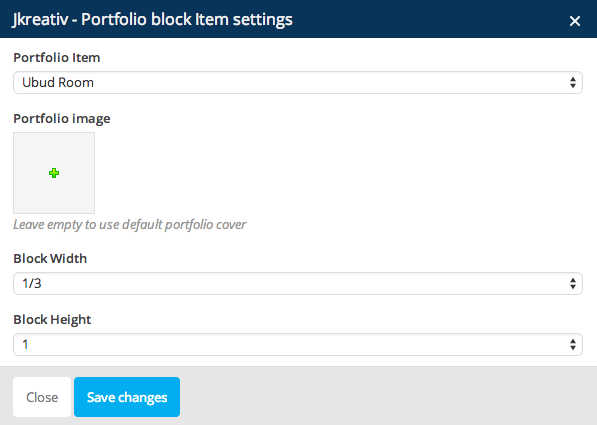 Portfolio Item : Select portfolio item you want to add. 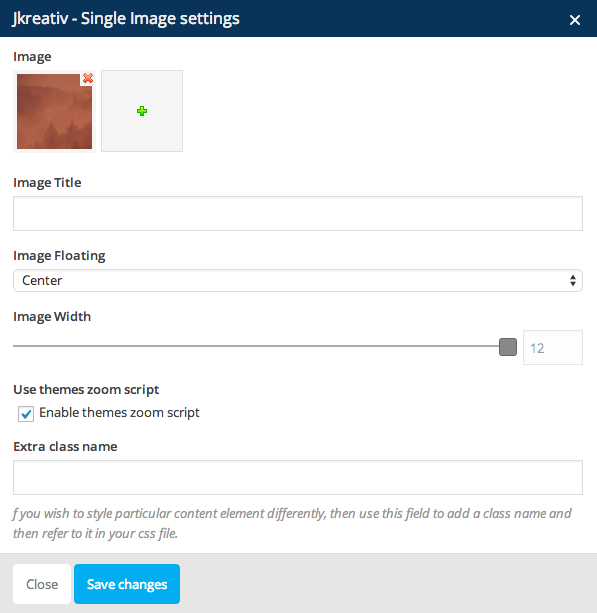 Portfolio Image : Select or upload image for portfolio cover (thumbnail). Leave it empty if you want to use default portfolio cover. Add pricing list of your product. Pricing Column Number : Set number of column for pricing table. 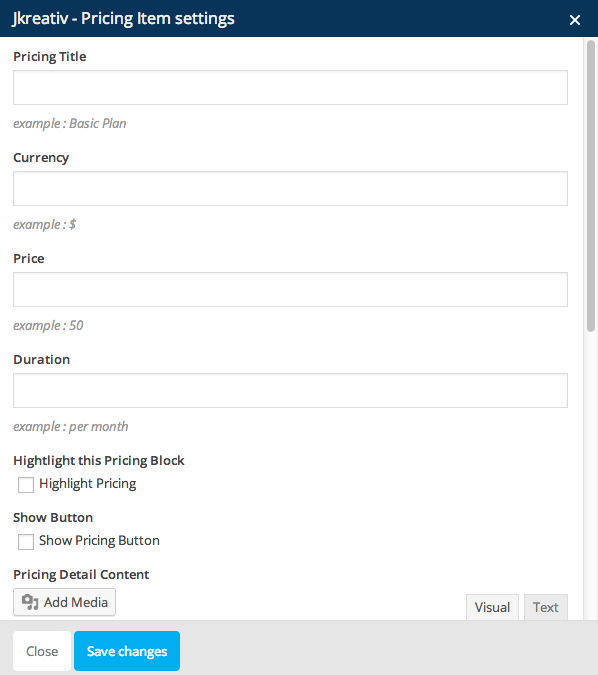 Pricing Title : Insert title of pricing table. Currency : Set currency that you want to use. Price : Insert the price value. Duration : Insert duration or periode. Highlight this Pricing Block : Enable this option if you want this item to be highlight. Show Button : Enable this option to show up the pricing button. Pricing Detail Content : Inset detail information content of pricing item. Widget Title : Insert title for widget. Leave empty if no titles is needed. Sidebar : Choose widget that you want to show up on sidebar.